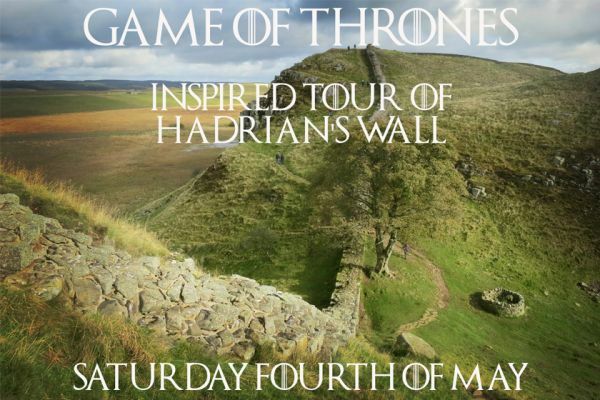 To celebrate the launch of the final season of the award winning tv series, Game of Thrones, we are providing a trip to Hadrian’s Wall. The initial inspiration for George RR Martin’s masterpiece began when he was in England visiting a friend in 1981. When they approached the border of England and Scotland, they visited Hadrian’s Wall in Northumberland. George stood up high on top of the wall and imagined what it would be like to be a Roman Legionary, looking out into the distant hills and unknown lands north of the wall. Almost 2000 years ago, this wall was built to mark the end of civilisation, to mark the end of the world as the Romans knew it and above all to keep out any unknown threats, monsters and dark forces that would threaten their territory. Of course we now know those threats to be the Celtic Scots. Back then however, Roman Centurions would have no idea what was beyond the wall and had to face the fear of the unknown. It was this that lead to the creation of the 300 mile long by 700 feet tall ‘Wall’ in Game of Thrones. Come experience what it was like to be both a Roman Guardian and a Celtic Invader as we explore the history of the best-preserved frontier of the Roman Empire as well as visiting locations such as Sycamore Gap for the ultimate photo opportunities among breathtaking scenery. Imagination is a wonderful thing and fortunately for us Spring has come, not Winter.